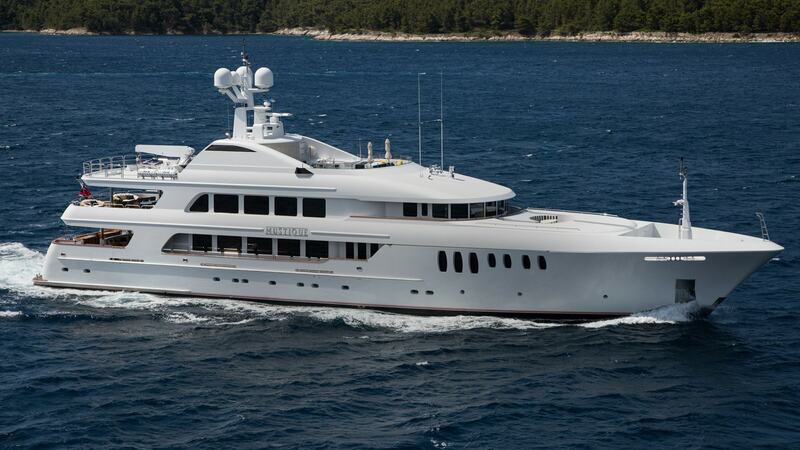 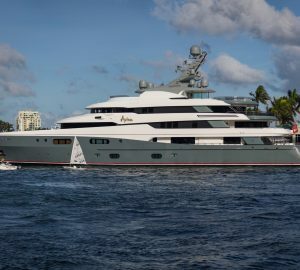 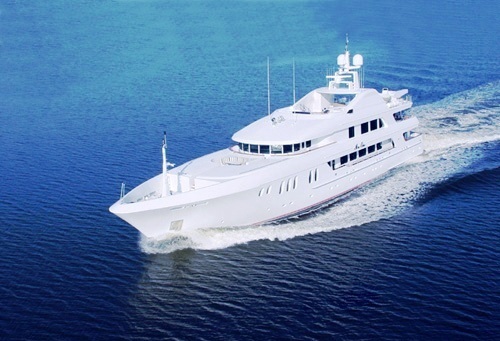 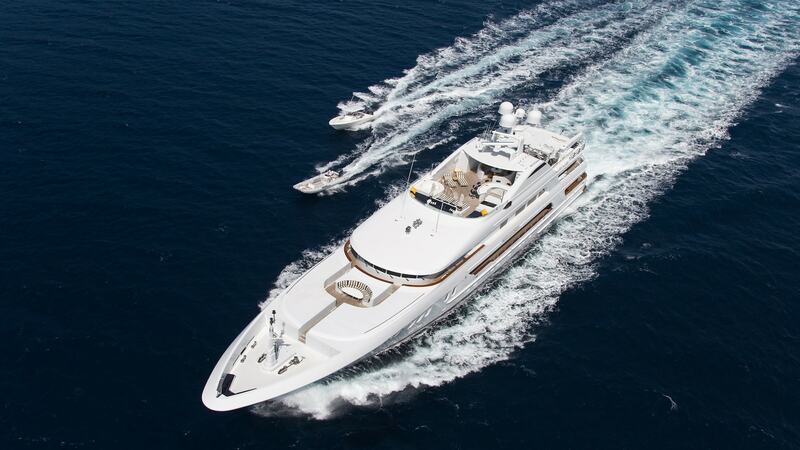 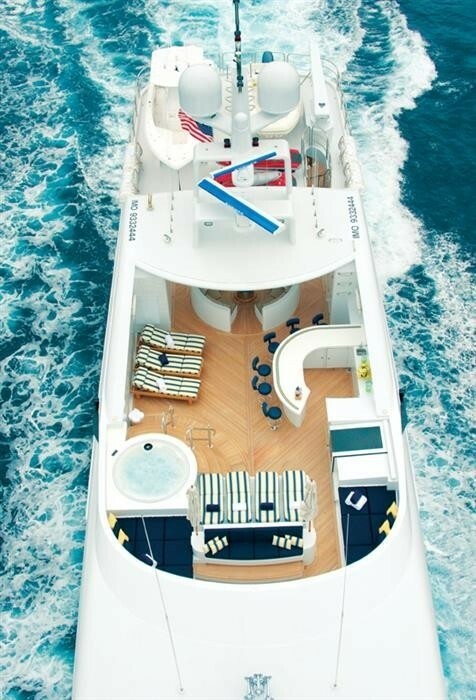 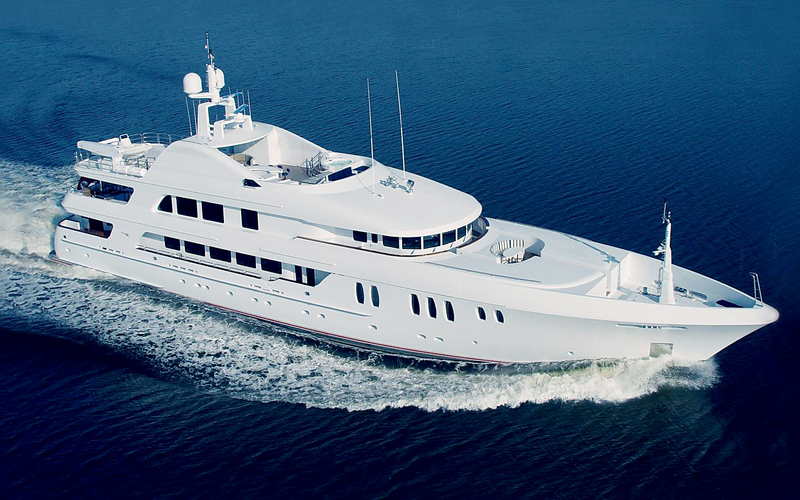 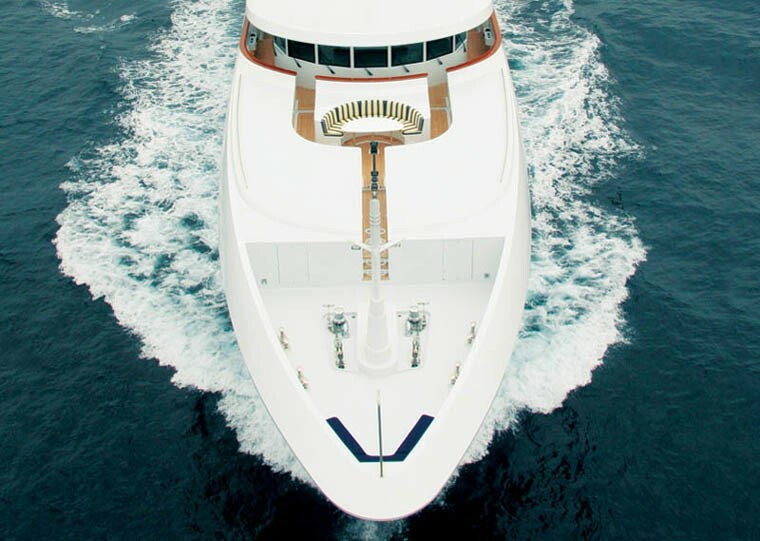 Luxury superyacht Mustique is large at 180 ft (55m) in length and boasts modern and powerful lines. 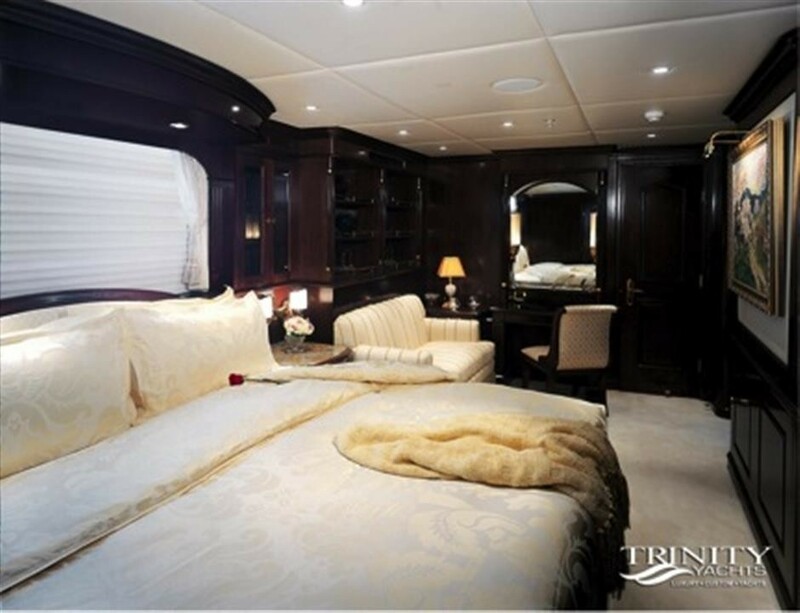 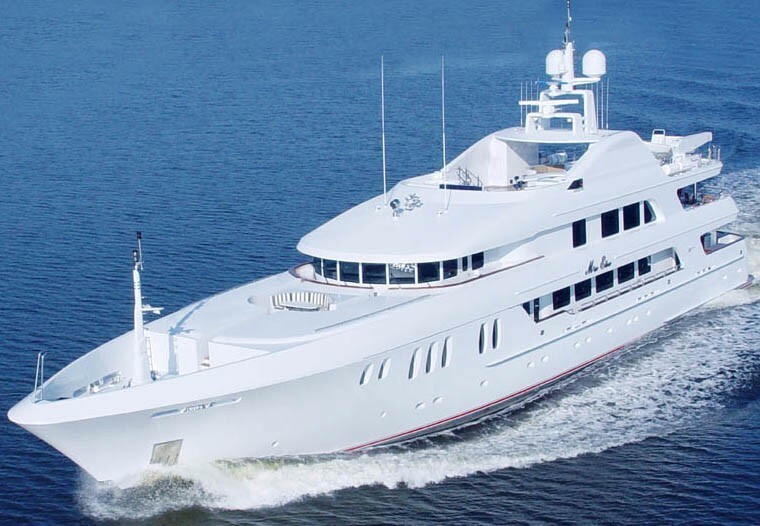 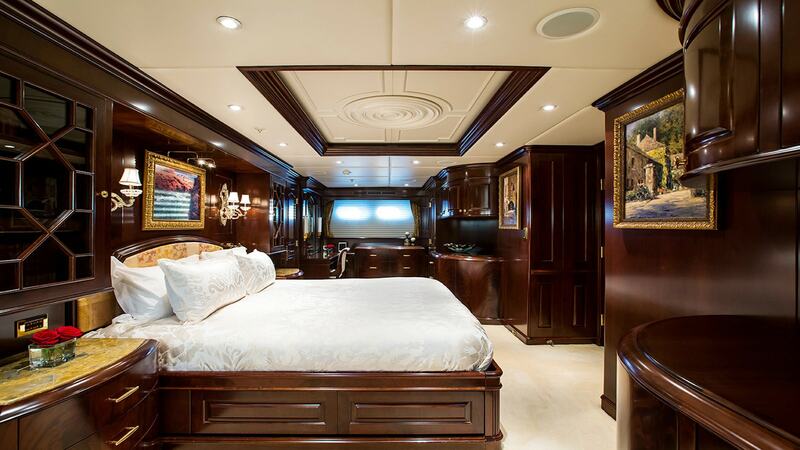 She was built by Trinity Yachts in late 2005 and her interior was stylishly designed by Dee Robinson. 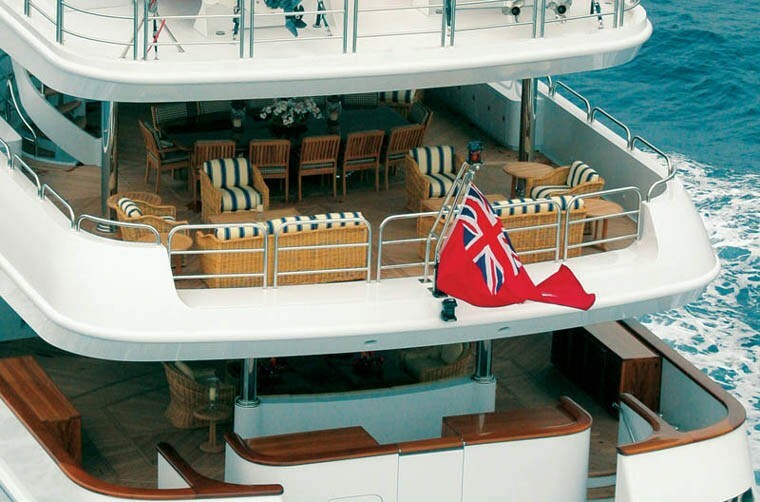 M/Y Mustique provides spacious, comfortable and luxurious cruising and boasts an exquisite master suite. 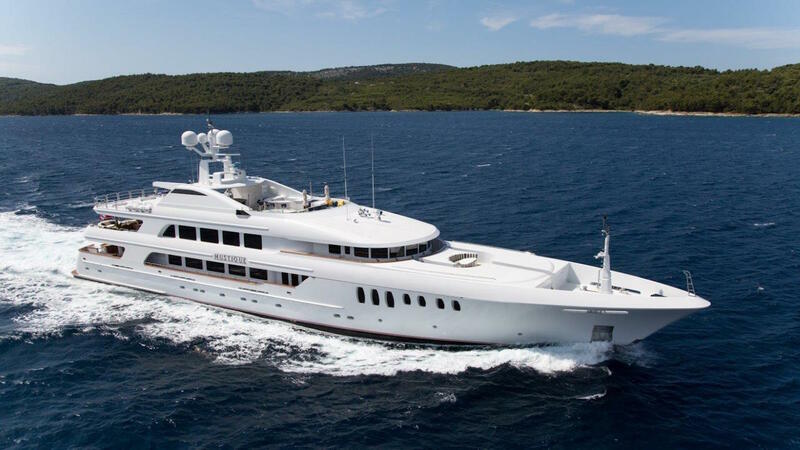 She charters in both the Mediterranean and Caribbean and has St Maarten and Monaco as her respective winter and summer bases. 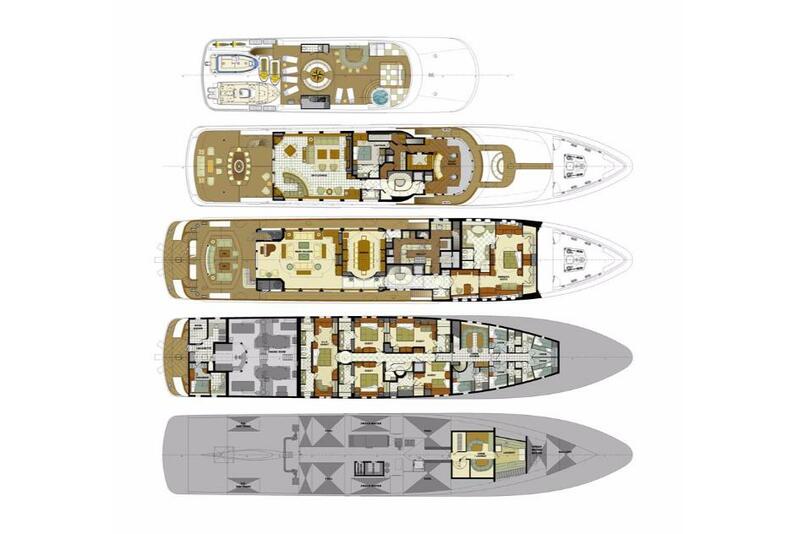 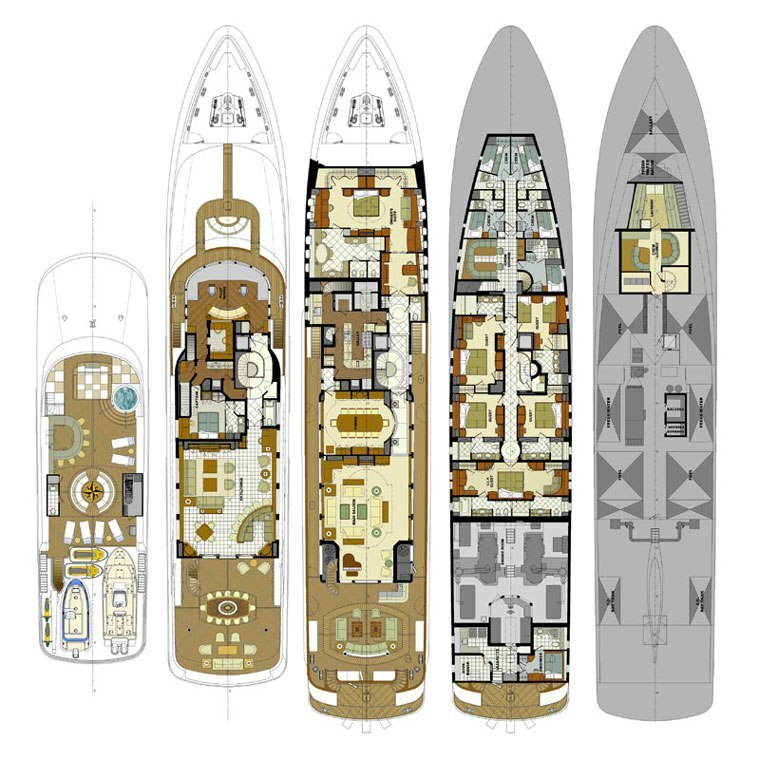 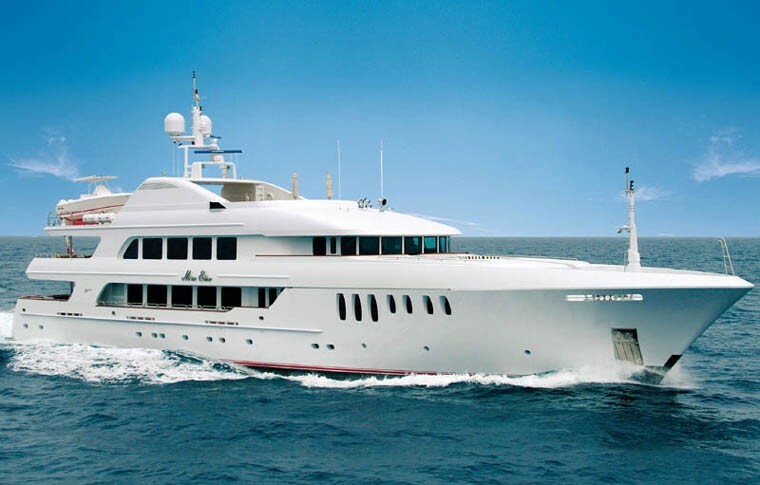 Her special design features include a Fast cruising speed of 15 knots, a Full beam master Owner's suite, Full beam VIP Guest stateroom below deck, a Large exterior aft Pilothouse deck, a Full beam Sky lounge, a Passenger elevator servicing four (4) interior decks, and a Sound booth in the Engine room. 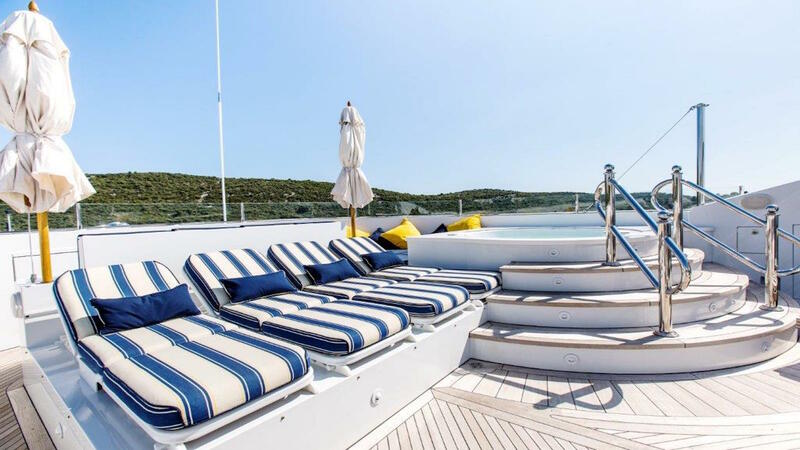 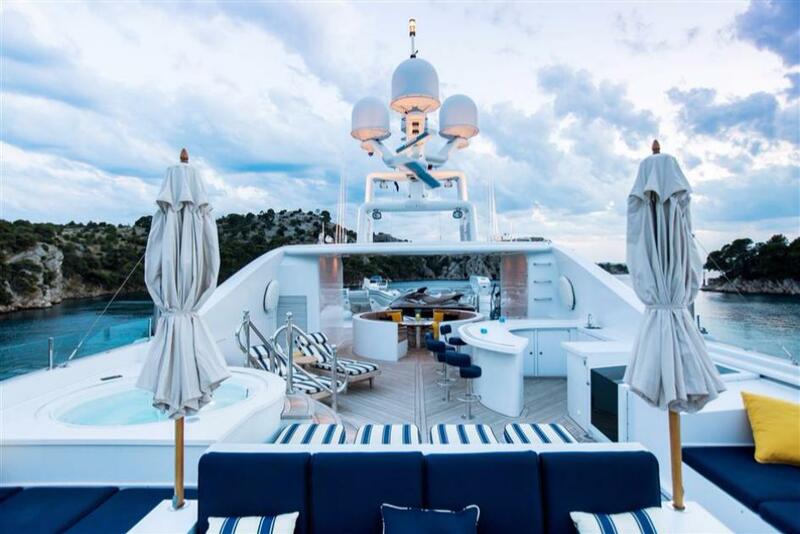 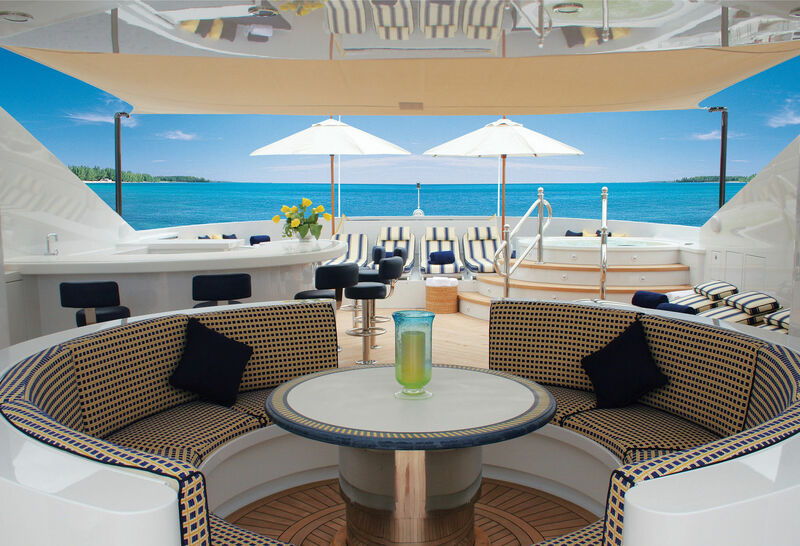 M/Y Mustique offers a comprehensive range of amenities and yacht charter beach toys for your Mediterranean or Caribbean charter, including a Spa Pool on the spacious sun drenched sundeck, a shower, large sun pad and 2 large umbrellas. 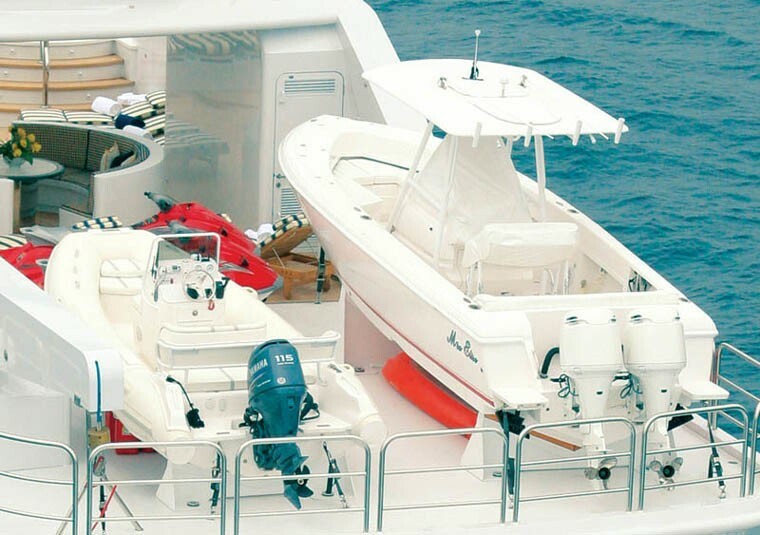 There are also "zero speed" at anchor stabilizers that provide unsurpassed, comfortable, pleasant chartering and calm anchorages. 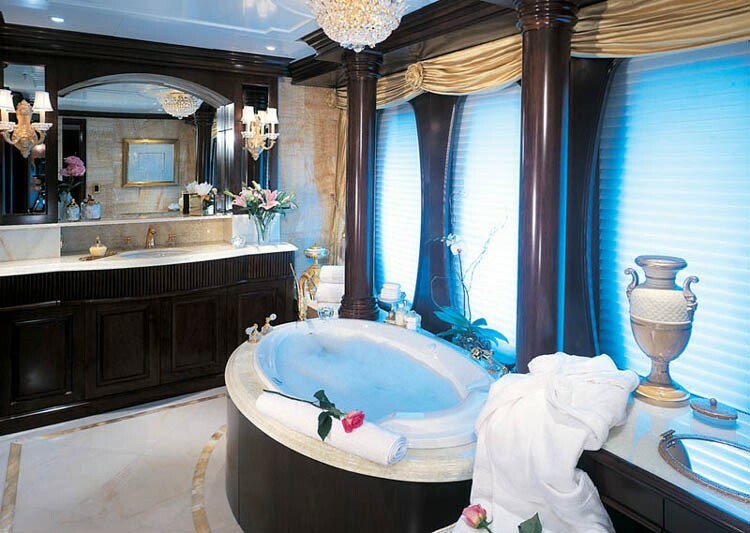 Other amenities include a large screen TV, DVD, VCR & CD in each of the spectacular stateroom ensuites, a baby grand piano, superb game table, sat & cell phone, fax & email. 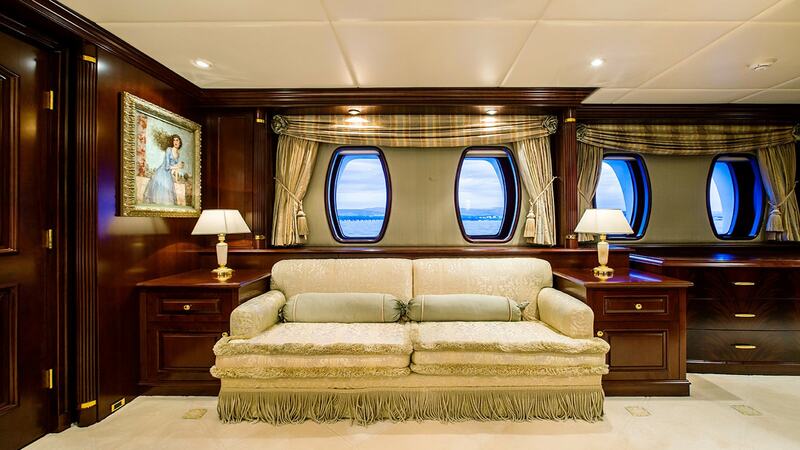 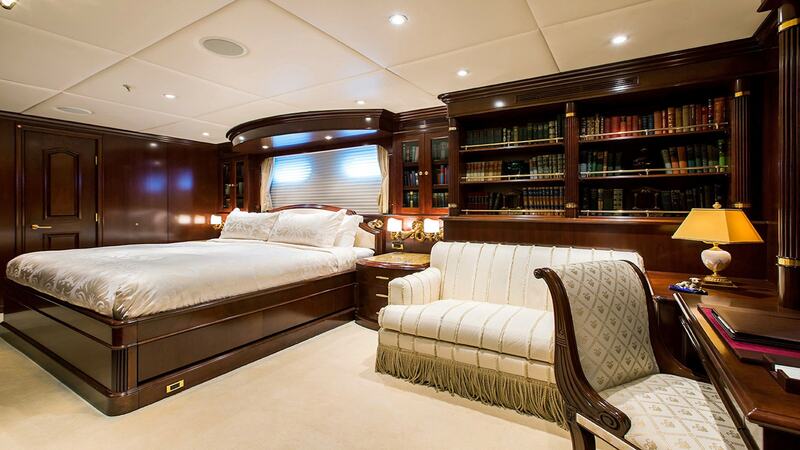 Luxury motor yacht Mustique's impressive interior decoration includes an exquisite master suite boasting exquisite furniture made of stunning classical dark wood matched with luxurious ecru carpet. 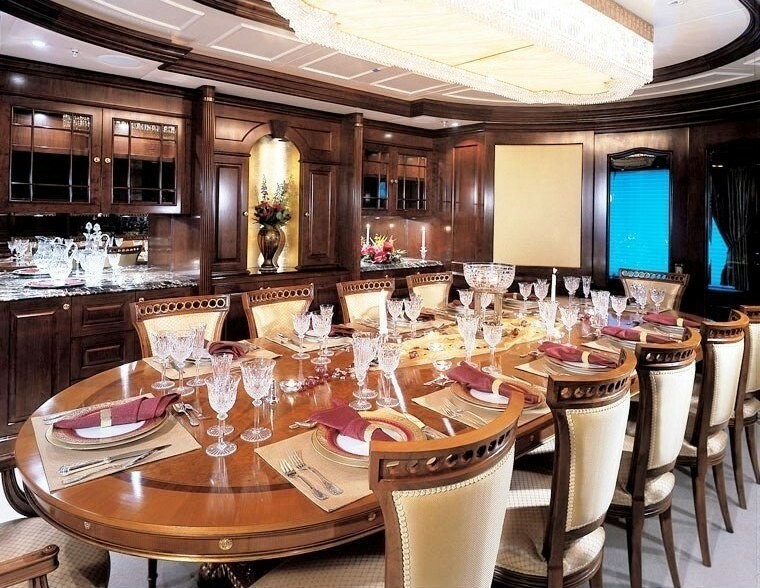 The gorgeous decor theme is subtlety expressed in an elegant, sophisticated aesthetic fashion. 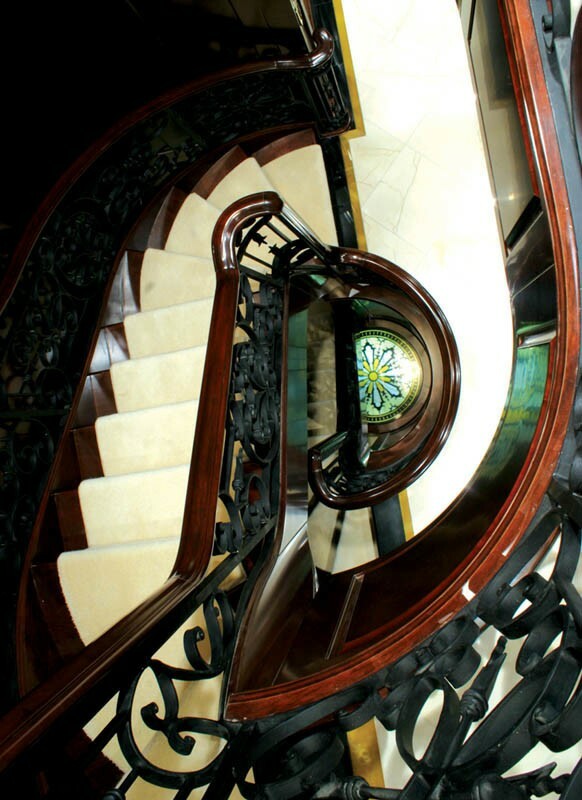 The lovely, welcoming entry desk is set against the finest ovoid window treatment, which is ideally situated along a spacious aisle, which leads to the entrance of the spectacular master sanctum. 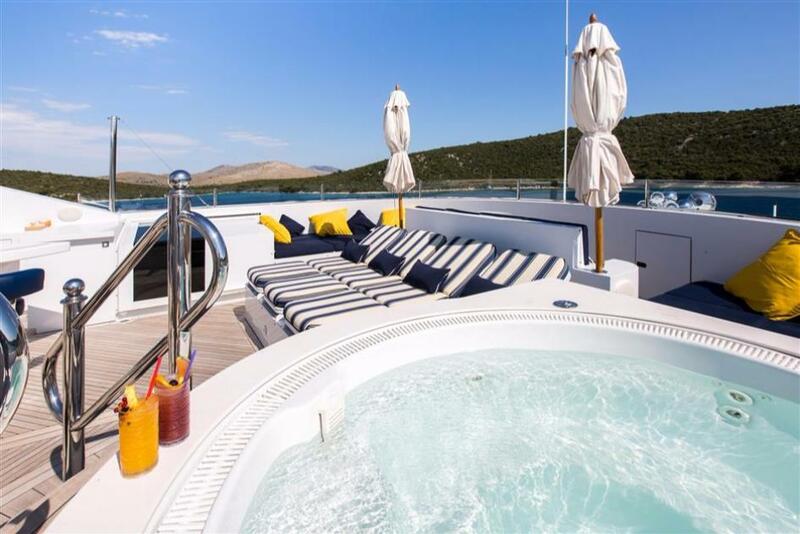 The overall impression is that of utmost quality, spacious luxury and sophistication with gorgeous top level accoutrements with romantic candlelit dinners for a lovely ambience. 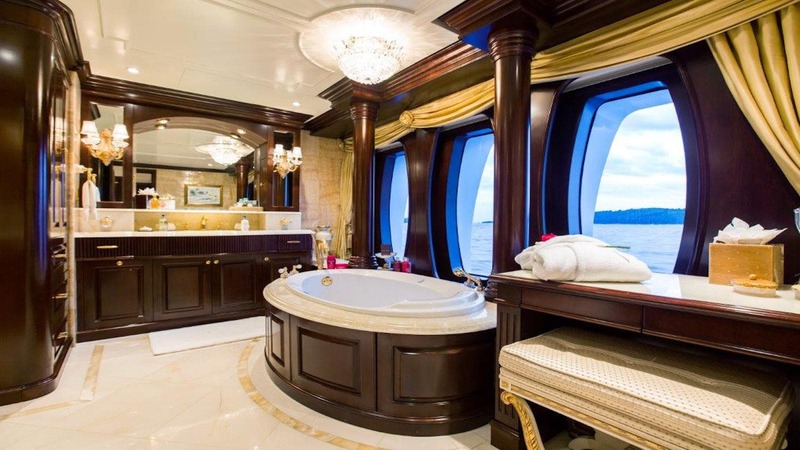 The beautiful master bath extends and continues with the spectacular design of the lovely master stateroom including a magnificent oval bathtub. 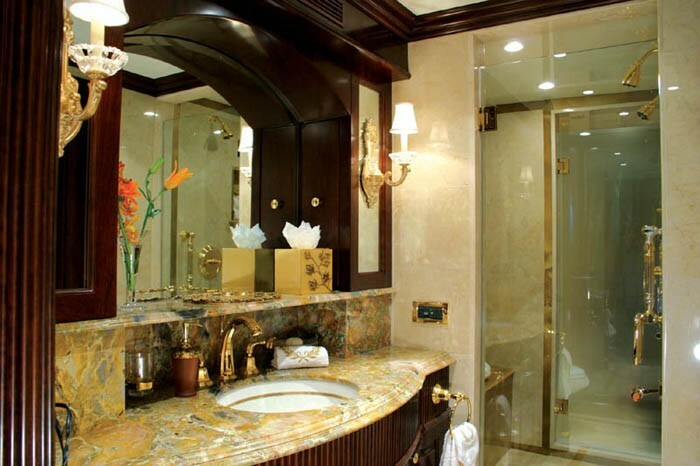 If that is not enough there is marble vanity and there are beautiful gold accents in the lovely flooring. 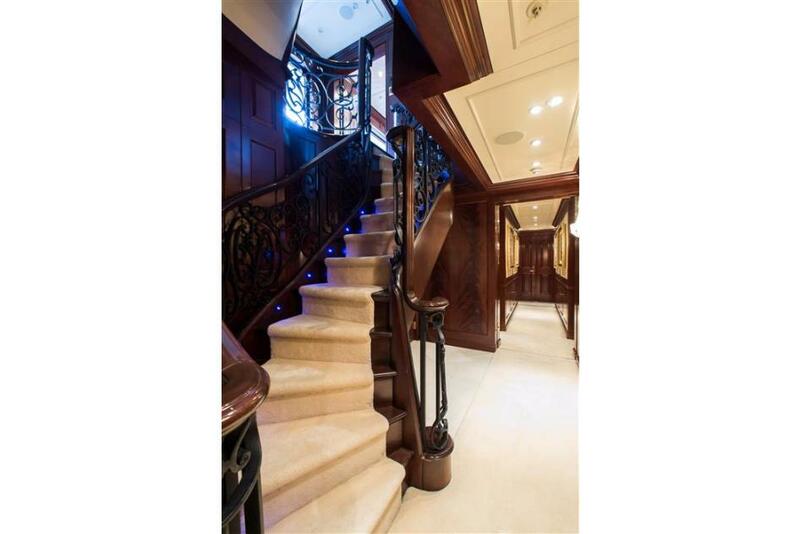 Impressive quality design with character. 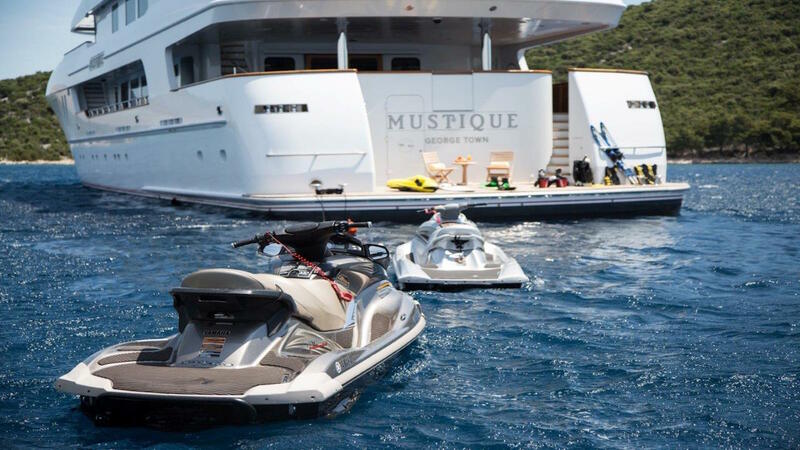 Mustique had a gallery built to withstand years of unparalleled service. 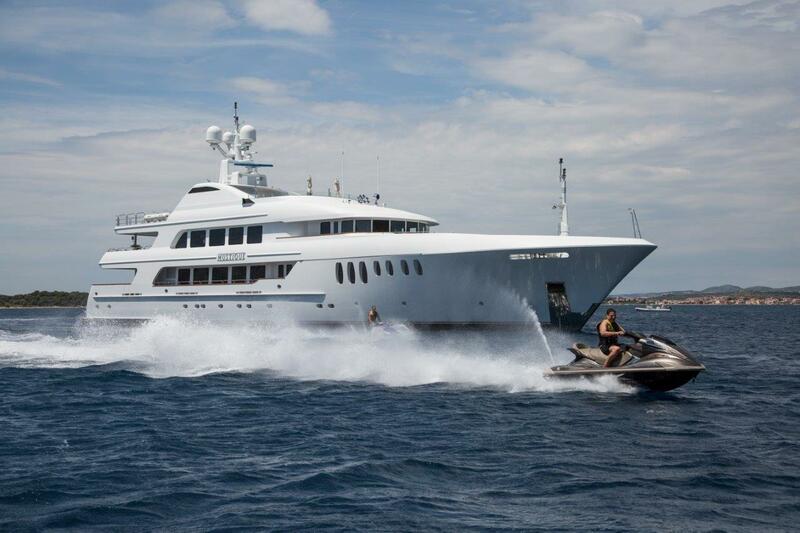 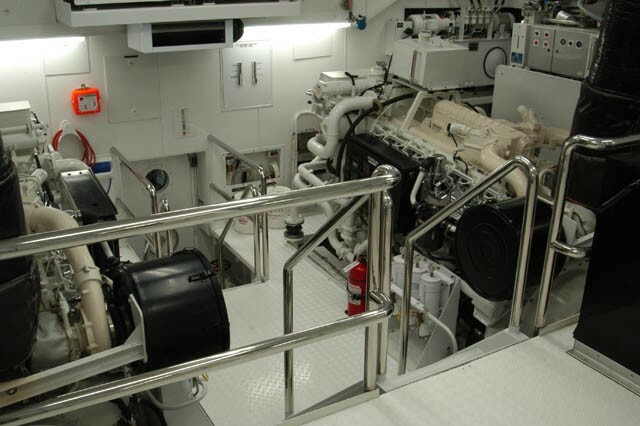 There are twin 1650 hp Caterpiller diesel engines which are at the heart of this magnificent charter yacht. 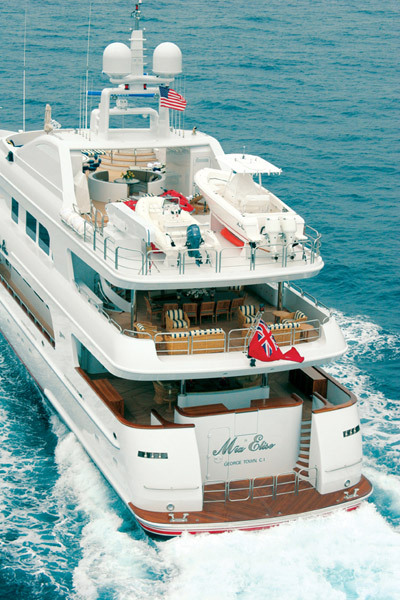 While cruising at a slower 12 knots (as apposed to 15 knots), M/Y Mustique has an impressive range of 4 500 nautical miles. 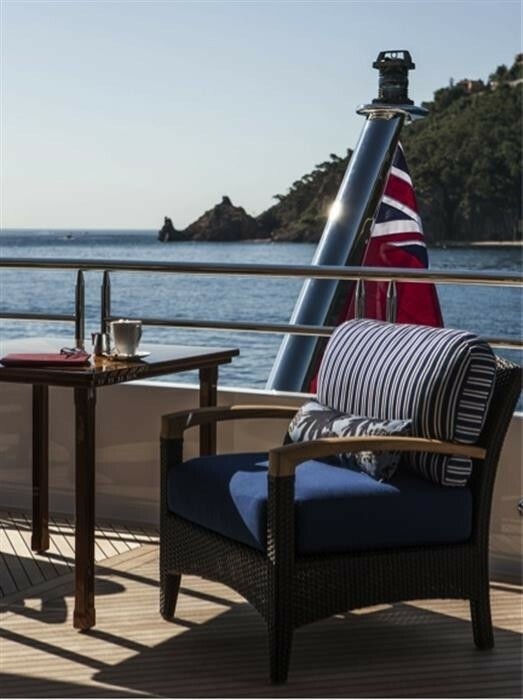 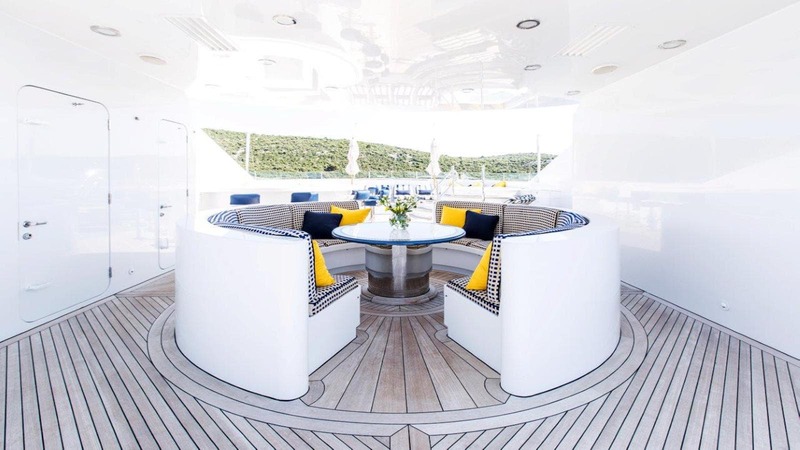 Below the gorgeous decks of the Motor yacht Mustique is the Tank Deck which excellently caters for the superb mechanical adroitness of this magnificent charter yacht. 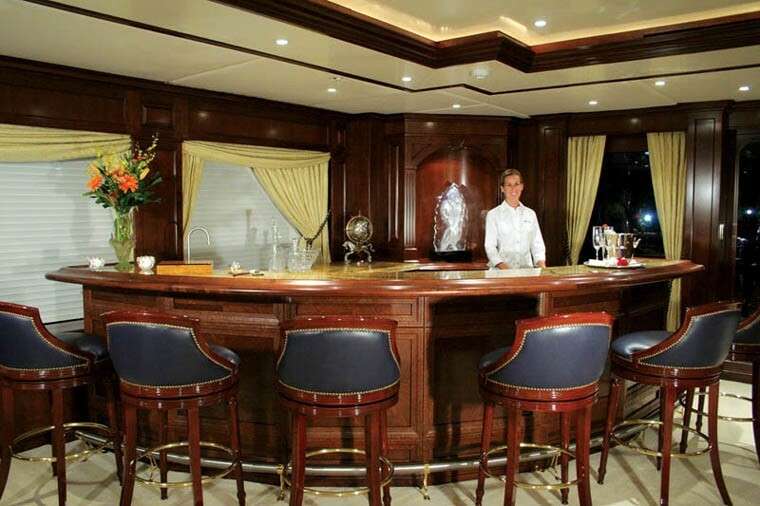 It also has built-in stabilizer compartments and other equipment that is needed. 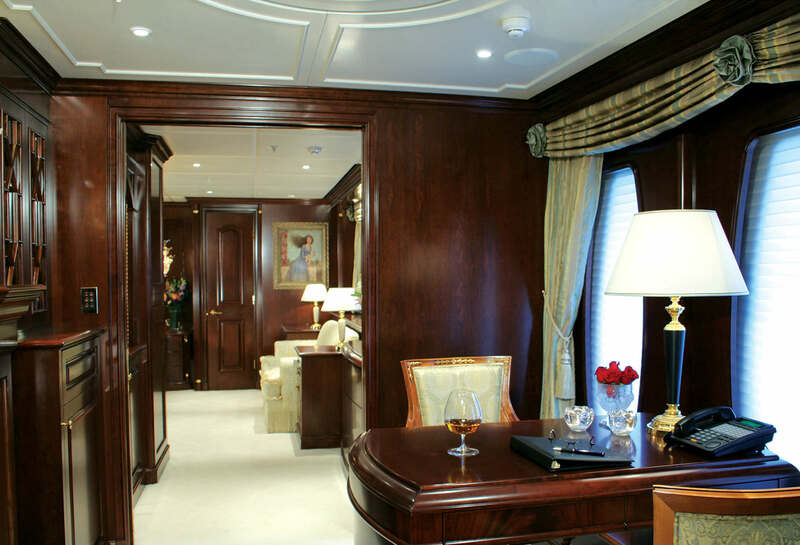 The master stateroom is very impressive with a complete balance in colour and shades, arrangement and various design elements that blend harmoniously into a perfect study of aesthetic distinction. 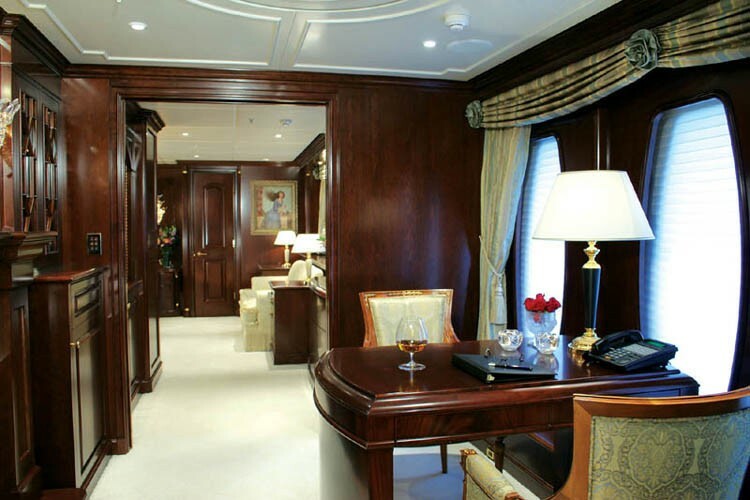 Dark tones and shades contrast sharply with the bright blue and light shaded carpet with a slight touch of gold in the numerous picture frames and lovely neoclassic fixtures. 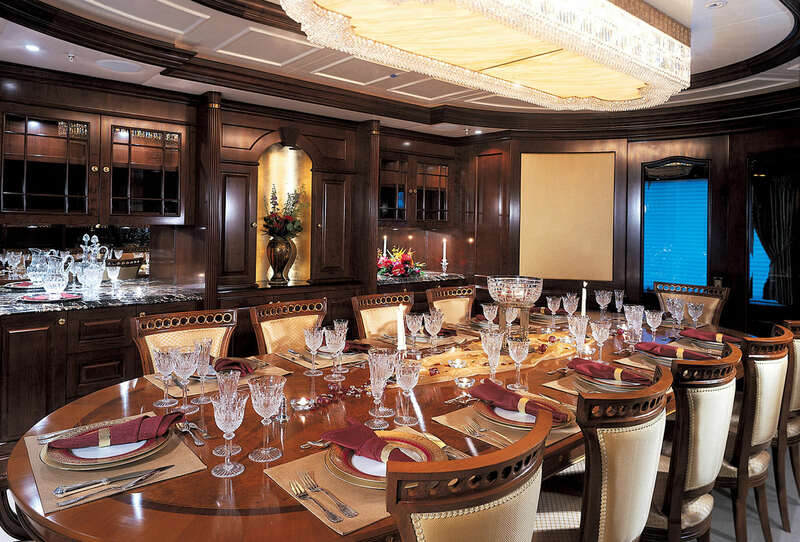 A 42'' plasma TV sits on a cabinet below a gorgeous chandelier hanging from the ceiling greatly enhancing the room. 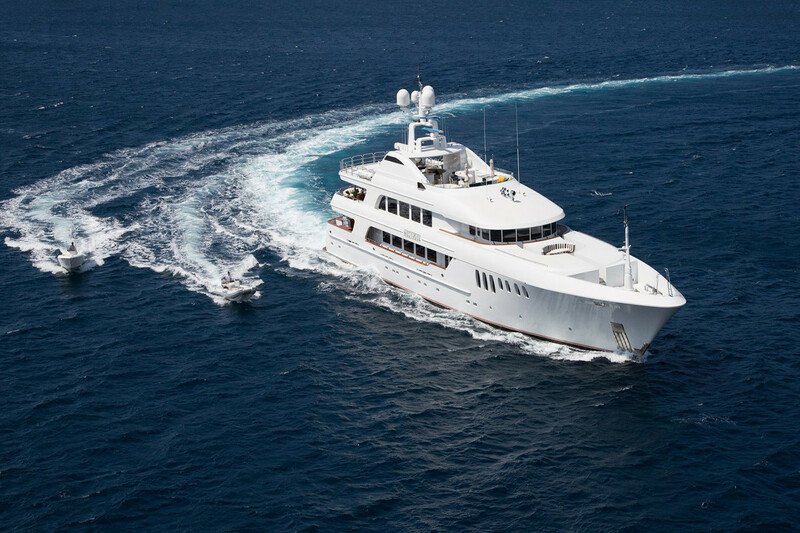 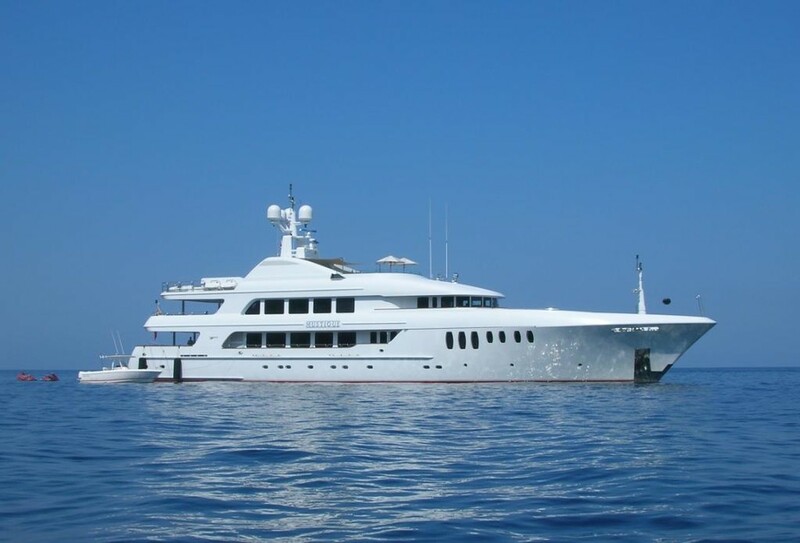 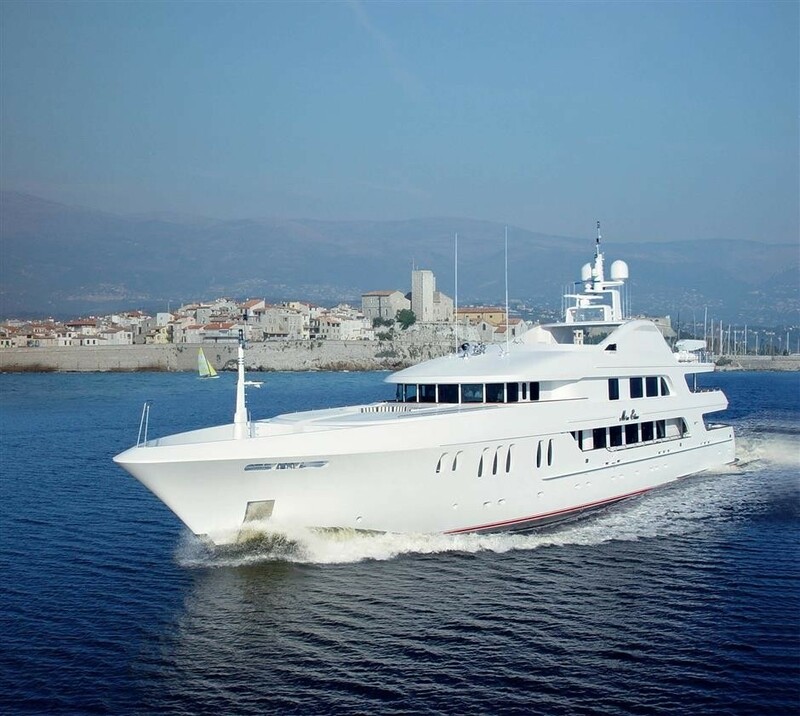 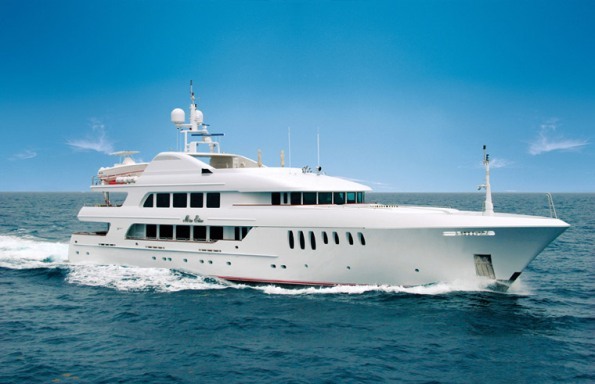 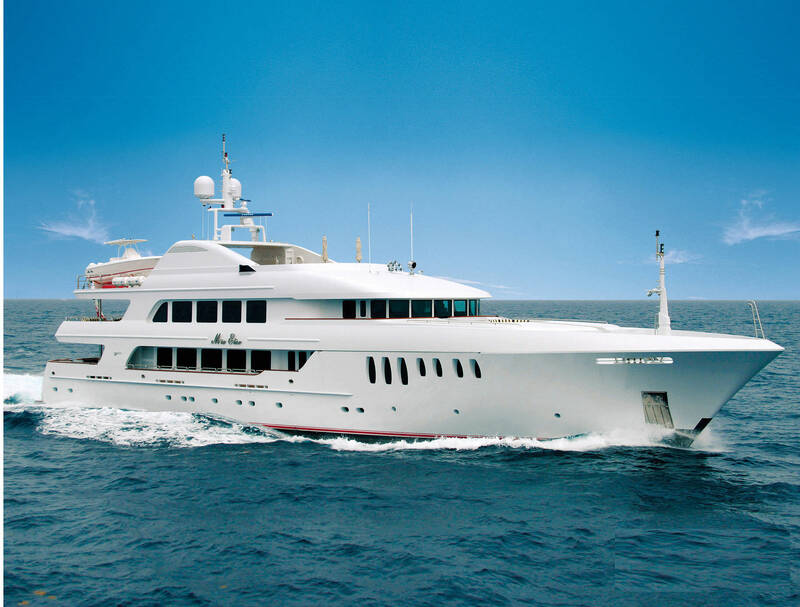 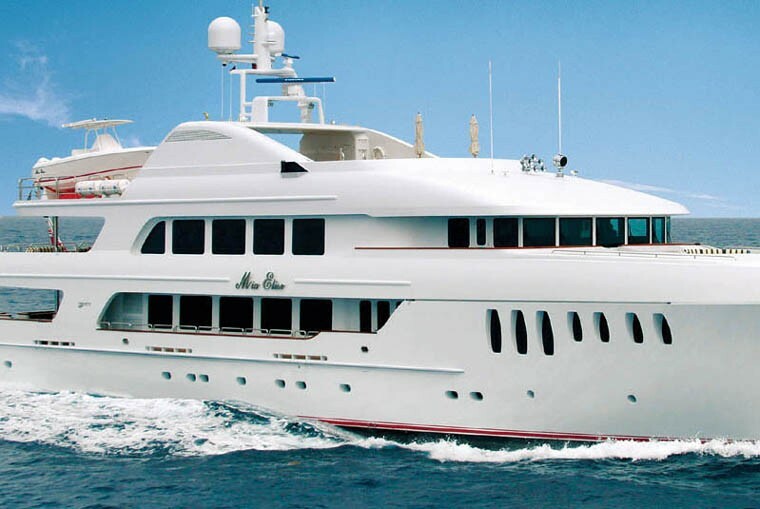 Luxury Yacht Mustique (ex Mia Elise) provides yacht charter luxury accommodation for a maximum of 12 guests in a total of 6 fully en suited staterooms. 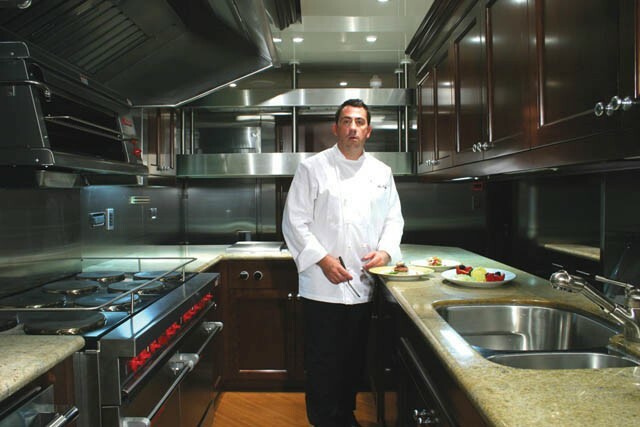 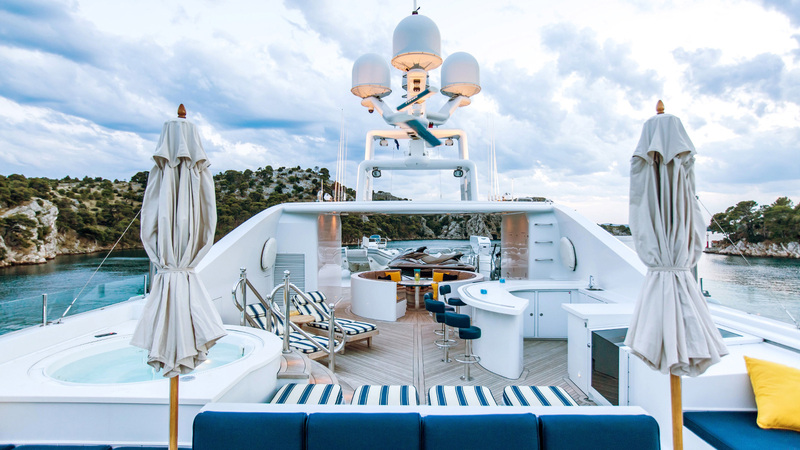 The beautiful yacht is run by 13 crew members, each of the friendly crew members are trained professionals who will endeavour to provide outstanding levels of hospitality and the highest level of service. 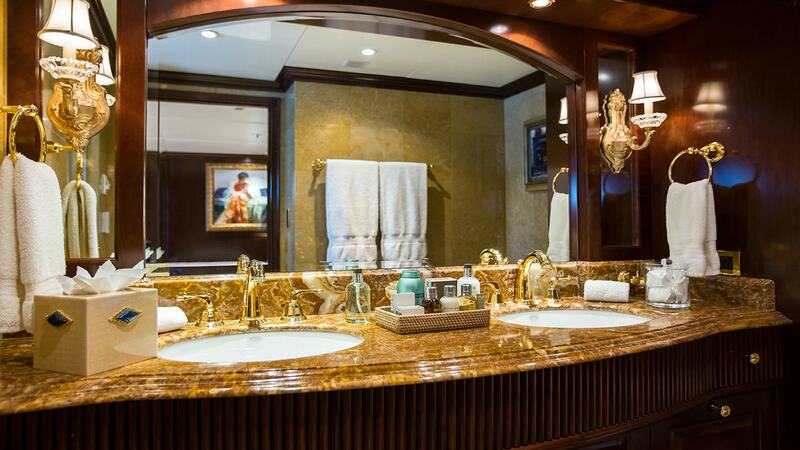 Mustique provides an exquisite master suite with a king-sized bed with a fully en suite bathroom with a shower, and quaint dressing room. 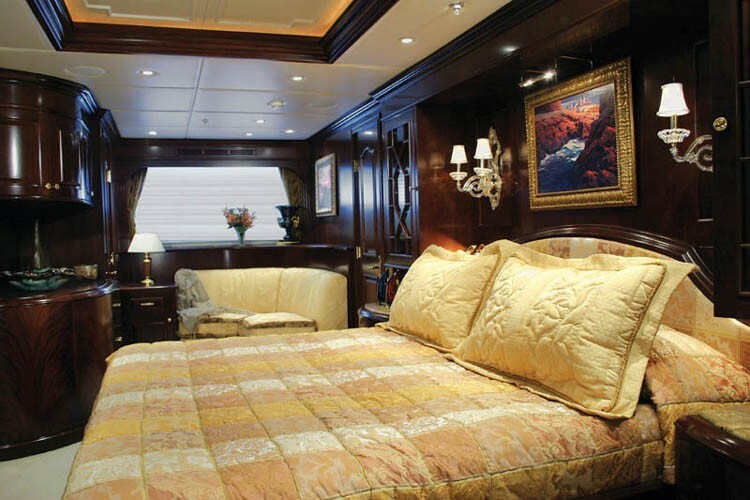 Additionally, there are another 4 beautiful king-sized quest cabins and lovely 1 twin cabin. 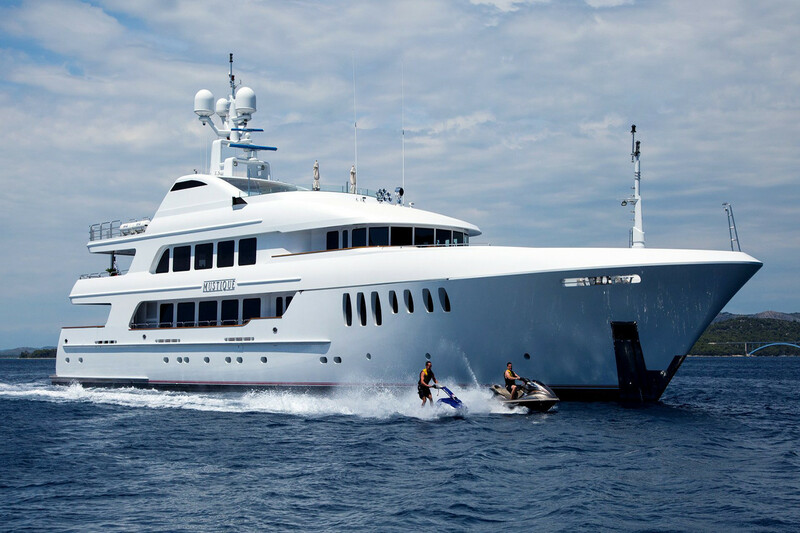 Luxury M/Y Mustique provides a wide range of assorted yacht charter beach toys: large screen TV, DVD, VCR & CD in each stateroom ensuite, Spa Pool on the spacious sundeck, shower, large sun pad & two large umbrellas. 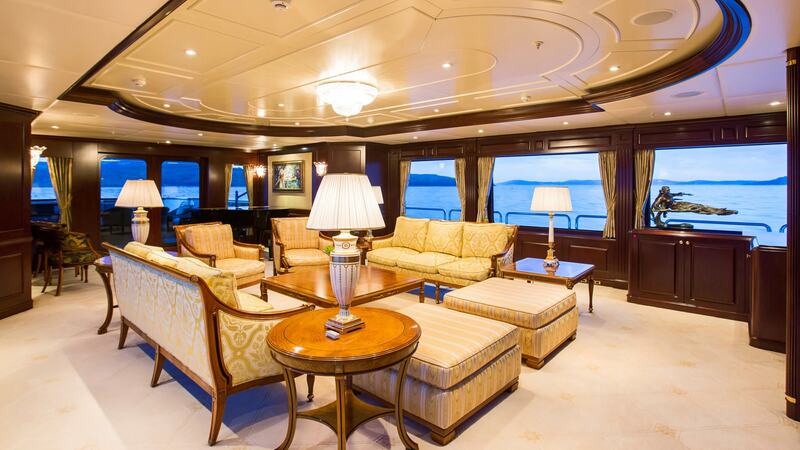 There is also a baby grand piano, superb game table, sat & cell phone, fax & email. 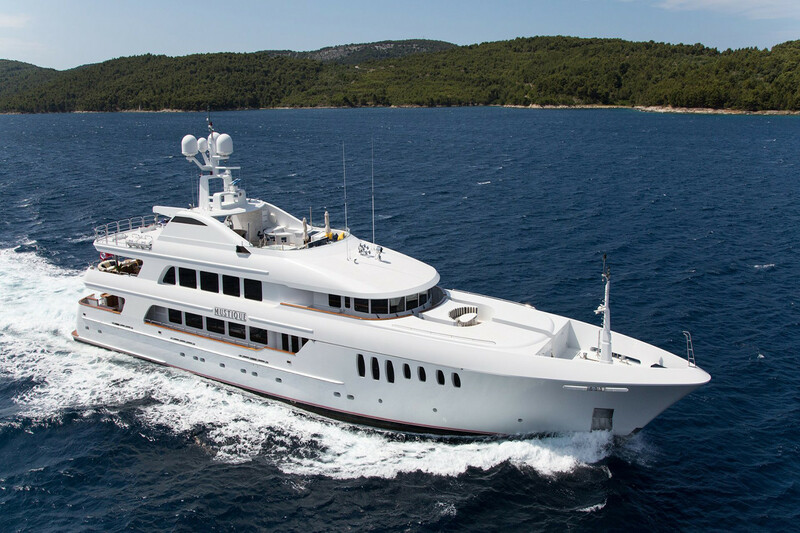 She also has "Zero speed" stabilizers that offer unparalleled, comfortable when chartering and anchored. 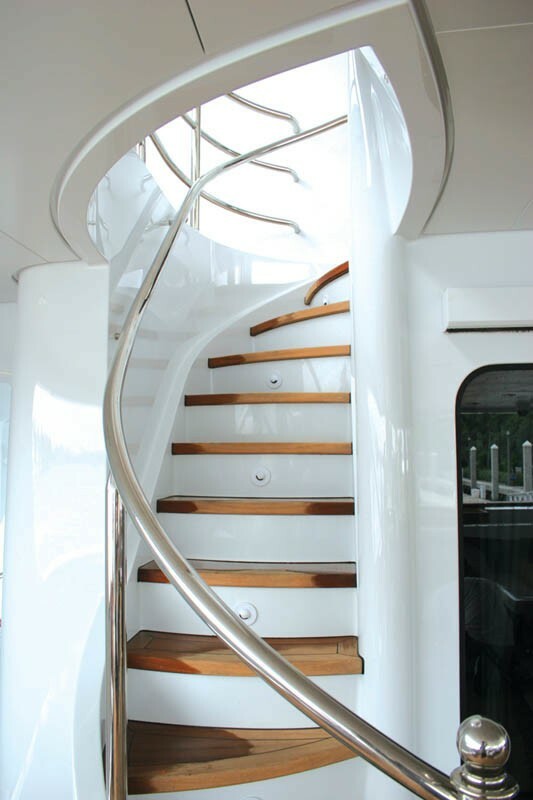 An Elevator from the guest accommodation to skylounge deck. 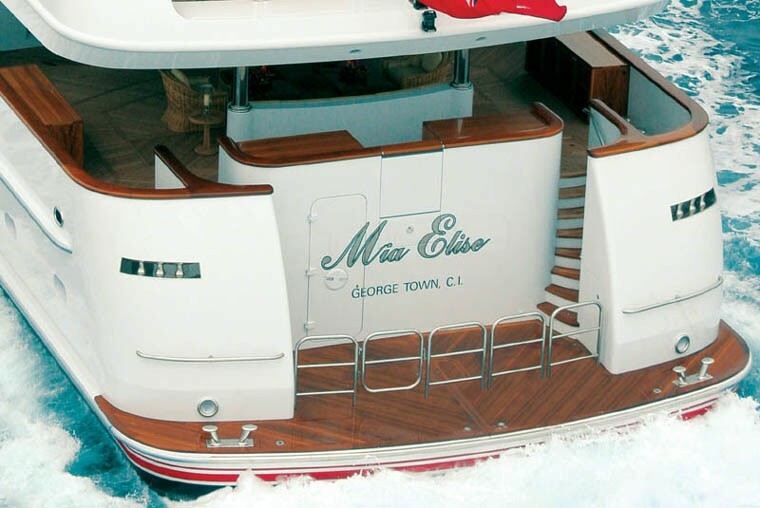 TENDERS AND WATER TOYS: Includes a 27 ft or 7.14 m Intrepid Center Console Tender with twin 200hp engines, a 17.9 ft or 5.45 m Nautica Tender with 115 hp (both pictured), two 2 man ‘Sea-Doo’ wave runners, snorkeling equipment, Boogie boards, water-skis, extensive fishing equipment, assorted beach toys, two x sea biscuits. 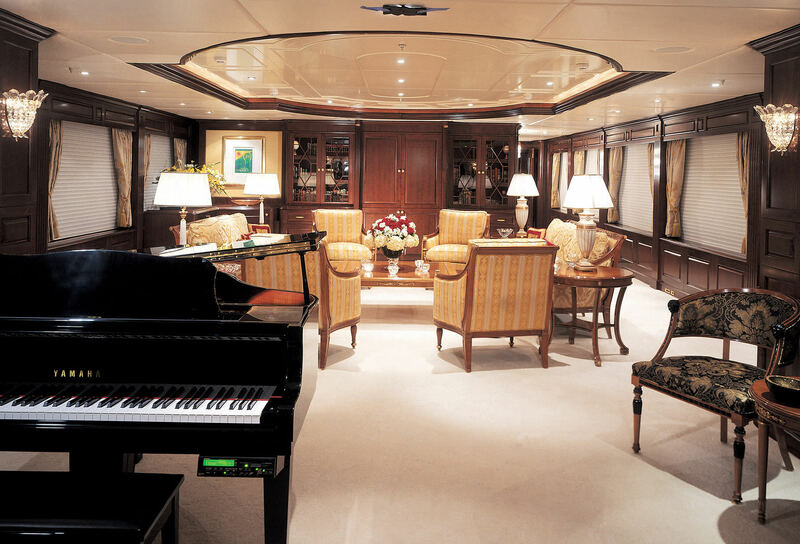 In the salon, there is: A Large screen TV & VCR & DVD-CD (surround sound STERIO), a Baby grand player piano, A Game table, and Music, book & DVD libraries. 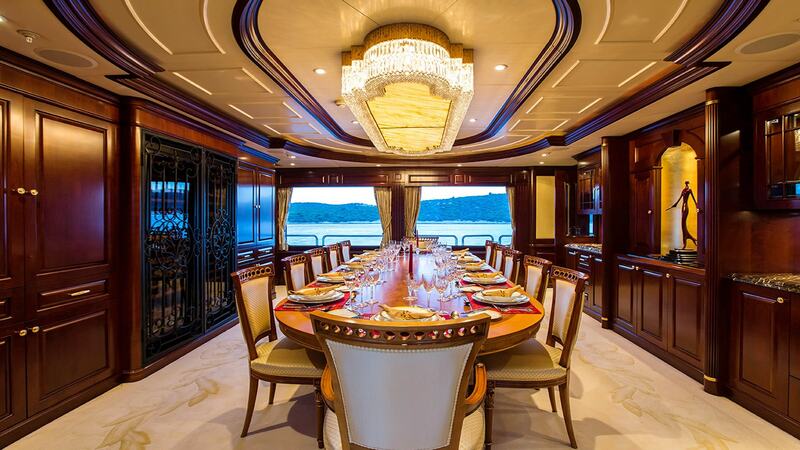 HER DINING SALON OFFERS: Seats 12 TO 14 guests and can be fully enclosed. A Powder room is forward. 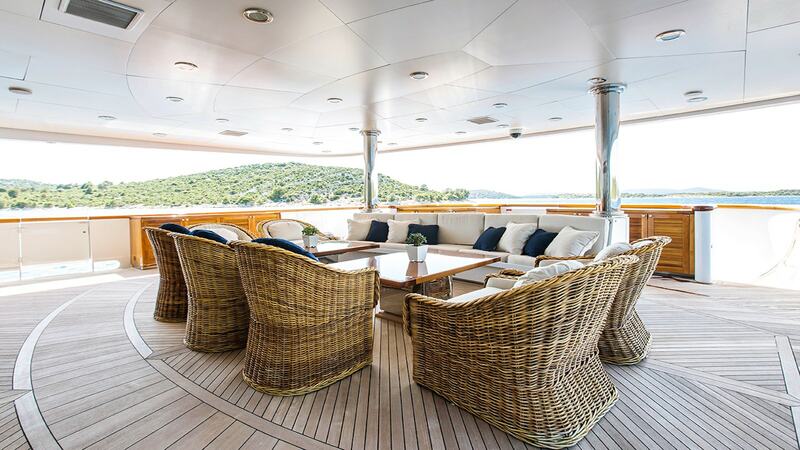 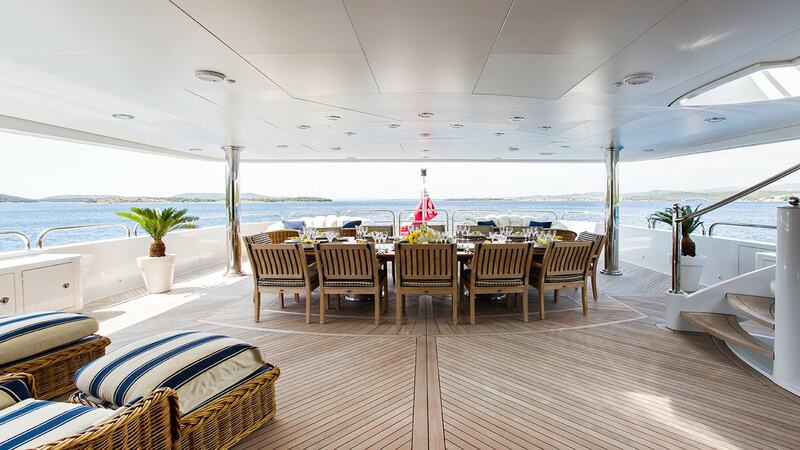 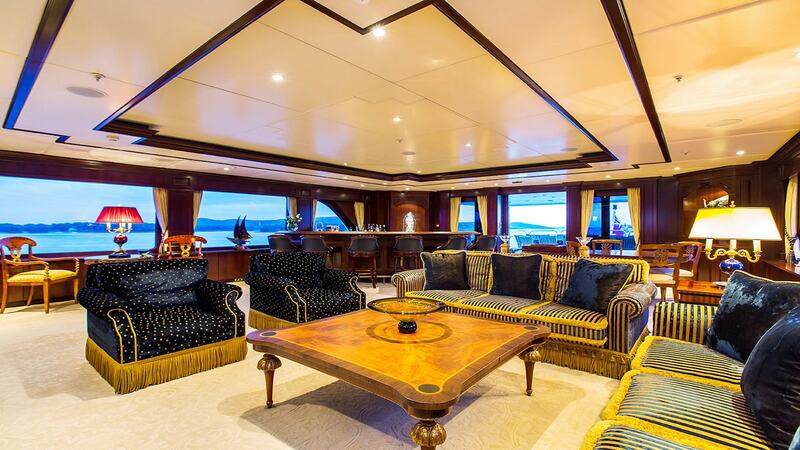 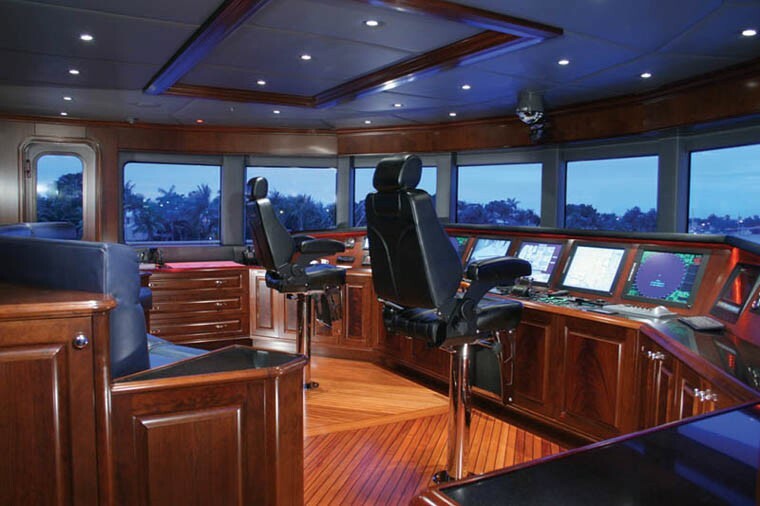 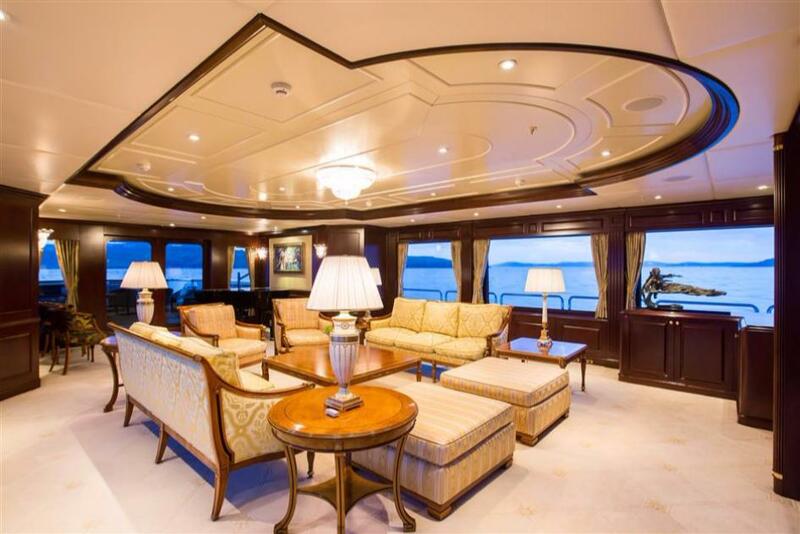 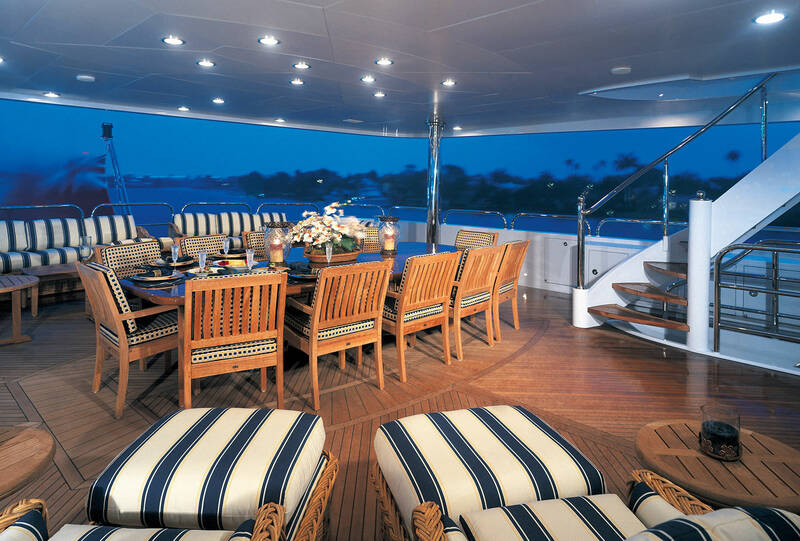 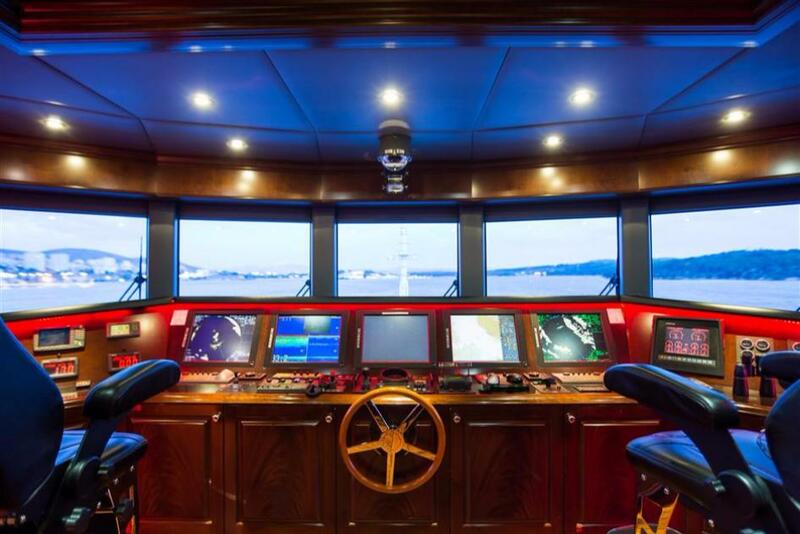 MAIN AFT DECK: Ample casual seating, a Wet bar. 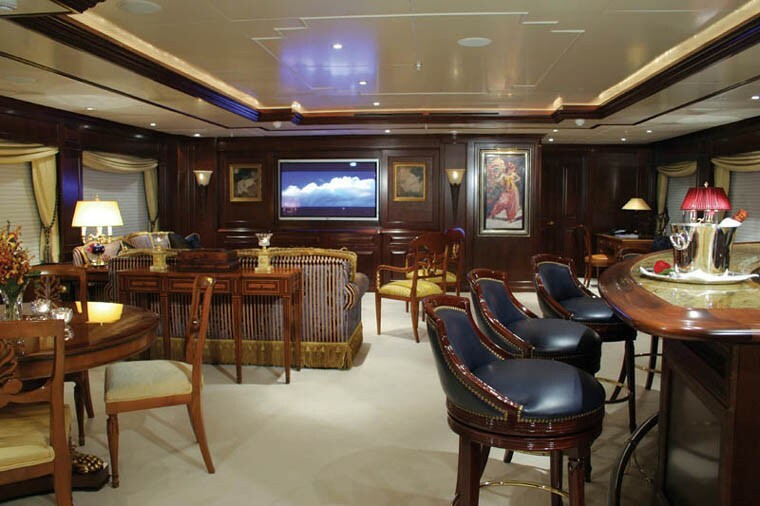 SKYLOUNGE: Large screen TV & VCR & DVD-CD (with surround sound), A Wet bar with stools, A Powder room forward. 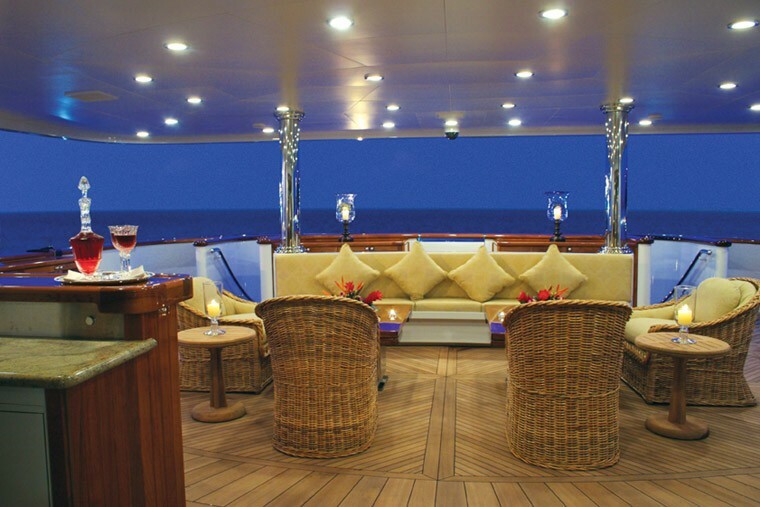 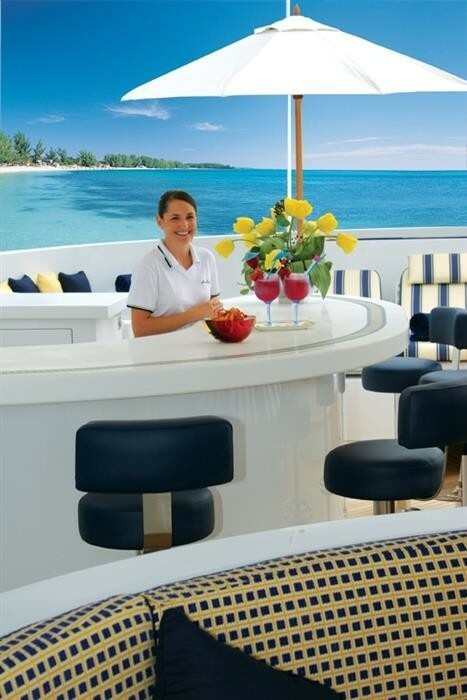 SKYLOUNGE AFT DECK: Open Dining for 12 guests, an Observation seated area forward of the main wheel house. 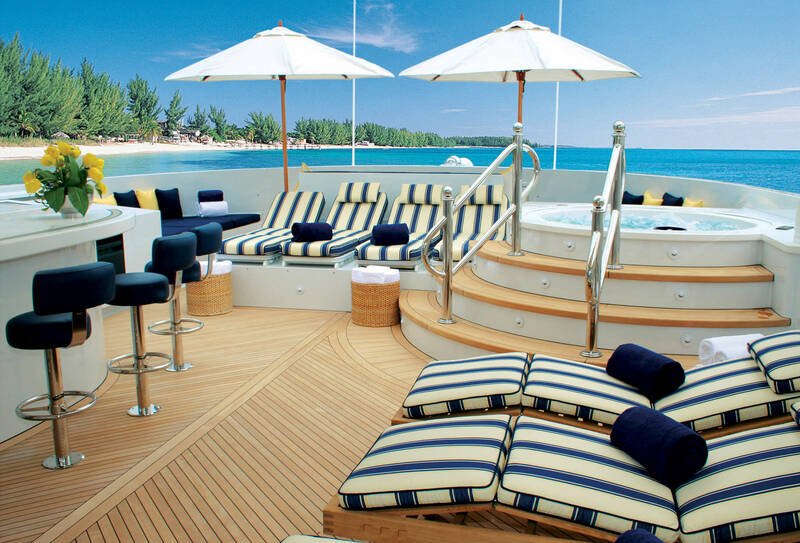 SUNDECK: A Spa Pool with large sun pads (including four convertible chaise lounge chairs), two umbrellas, a Wet bar & stools, A Retractable awning from arch forward to bar, six chaise lounge, a Central dining banquette for 8 (under the arch), A Treadmill, bench & free weights and Powder room. 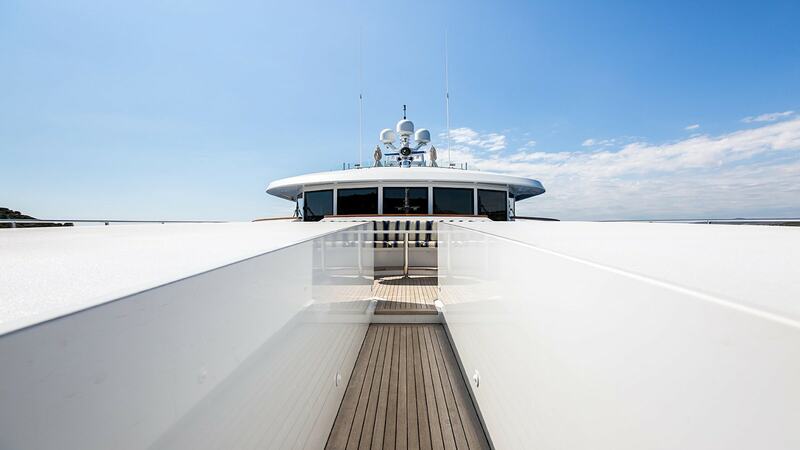 BOARDING & WATER ACCESS: Swimming platform with dual access staircase, a Passarelle (stern boarding bridge), as well as Port & starboard boarding.